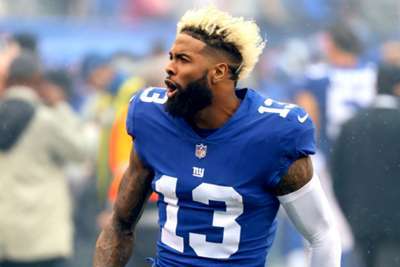 Odell Beckham Jr. should focus on creating headlines on the field by doing a "little more playing and a little less talking", according to the owner of the New York Giants. Wide receiver Beckham signed a lucrative five-year contract extension with the Giants at the end of August but has struggled to put up big numbers in a team with just one win from their first six outings. The former first-round pick, who has registered 45 catches for 506 yards and one touchdown this season, got candid about his team during an interview with ESPN last week, including questioning quarterback Eli Manning, and head coach Pat Shurmur, as well as his own willingness to stay in New York. He was fined by the Giants for his comments and John Mara admits to being disappointed with how Beckham - who headbutted an air-conditioning unit to during the loss to the Philadelphia Eagles last Thursday in an attempt to get "fired up" - has carried himself off the field. "I wish he would create the headlines by his play on the field as opposed to what he says and what he does off the field," Mara, speaking to reporters at the NFL owners' meeting in New York on Tuesday, said. "I think he needs to do a little more playing and a little less talking." Mara admitted he was "embarrassed" by the team's 1-5 record but insisted the Giants retained faith in veteran quarterback Manning, despite his struggles this season. "When you're 1-5, it generally means that everybody needs to play better," he told the media. "He [Manning] is not alone. A lot of guys just need to do their jobs. We still believe in him. Everybody needs to do their jobs for us to be successful, and right now, that's not happening." The Giants will bid to record just their second win of the campaign when they take on the Atlanta Falcons on Monday.